For your convenience, we have partnered with an online retailer to make obtaining the required class items easy and affordable. Simply click the “Purchase Online” button below and select your child’s class to see available options. 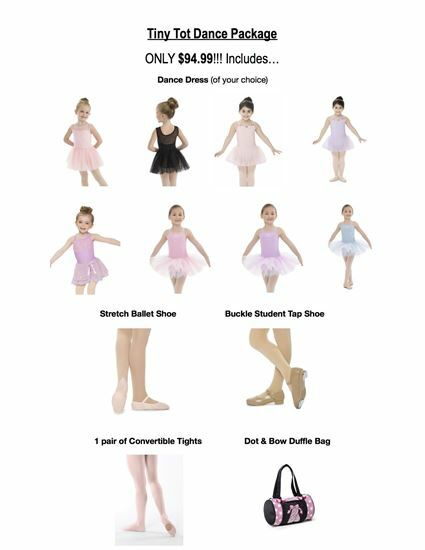 "In addition to our online store we keep a limited supply of dance wear in the studio for our Ballet, Tap & Tumble classes. This includes, dance dresses, pink ballet shoes, tan tap shoes & both pink and tan tights. All items are available for immediate purchase. Also, check out our Tiny Tot Dance Package below which includes everything your child needs for any of our Ballet, Tap & Tumble classes.